Heat Pump and solar appliances are the most socially accepted residential Renewable Energy based energy systems. SunHorizon will demonstrate up to TRL 7 innovative, reliable, cost-effective coupling of solar and HP technologies. SunHorizon addresses three main research pillars that interact each other towards project objectives achievement, demonstration and replication: i) OPTIMIZED DESIGN, ENGINEERING AND MANUFACTURING OF SUNHORIZON TECHNOLOGIES, ii) SMART FUNCTIONAL MONITORING FOR H&C, iii) KPI DRIVEN MANAGEMENT AND DEMONSTRATION. 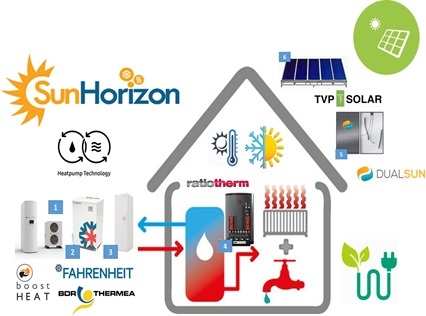 The main objective of SunHorizon is to demonstrate up to TRL 7 innovative and reliable Heat Pump solutions (thermal compression, adsorption, reversible) that acting properly coupled and managed with advanced solar panels (PV, Hybrid, thermal) can provide heating and cooling to residential and tertiary building with lower emissions, energy bills and fossil fuel dependency. A cloud-based functional monitoring platform will be realised in the project to be the “performance data mine” for the development of Data Driven/KPI oriented optimized algorithms and tools for predictive maintenance, optimize the management towards maximisation of solar exploitation and give to the manufacturer inputs for new installation design. 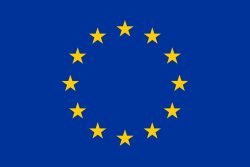 As stated in EU Strategy for Heating and Cooling, “large-scale demonstration projects of energy-efficient and low/zero-carbon technologies are needed to help reduce technical and market barriers by providing robust data to evaluate their performance in each market segment”. At this purpose SunHorizon aims to be a breakthrough demonstration to market project involving 21 partners’ expertise and 8 demo sites all around EU focusing its Research and demonstration activities on “reducing system costs and improving performance as well as optimising existing technologies for heating and cooling applications and for some of the most promising market segments”.